Ask anyone to name the first type of airplane that springs to mind, and the answer is likely to be the Boeing 747 jumbo jet. From 1970 until the 2007 introduction of Airbus’ A380, it was the largest passenger carrier ever, and the remarkable image of its bulky head has become part of our cultural consciousness. It may come as a surprise that this unique shape was not a design choice, but rather the by-product of an extremely complicated development process that involved gruelling effort, interminable paperwork, vehement debate and little attention to visual values. Passenger airplanes are extraordinary machines. They are a crucial element in a worldwide system that transfers millions of people safely and efficiently through thin, icy air over vast distances in a very short time. Day in, day out, they fly higher than the highest mountain ranges and move faster than any other means of public transportation. Yet there are surprisingly few of them: the total world fleet of all passenger airplanes presently amounts to 25,000 at the most, including almost 1,500 Boeing 747s. For comparison, over the past year 800,000 cars were sold in Beijing alone. Even a large airline such as British Airways typically operates fewer than 250 planes (a quarter of which are 747s) that make an astonishing total of 200,000 flights a year. When Boeing originally designed the 747 they considered it a low-end product, never suspecting that it would become a cultural icon of the modern era. 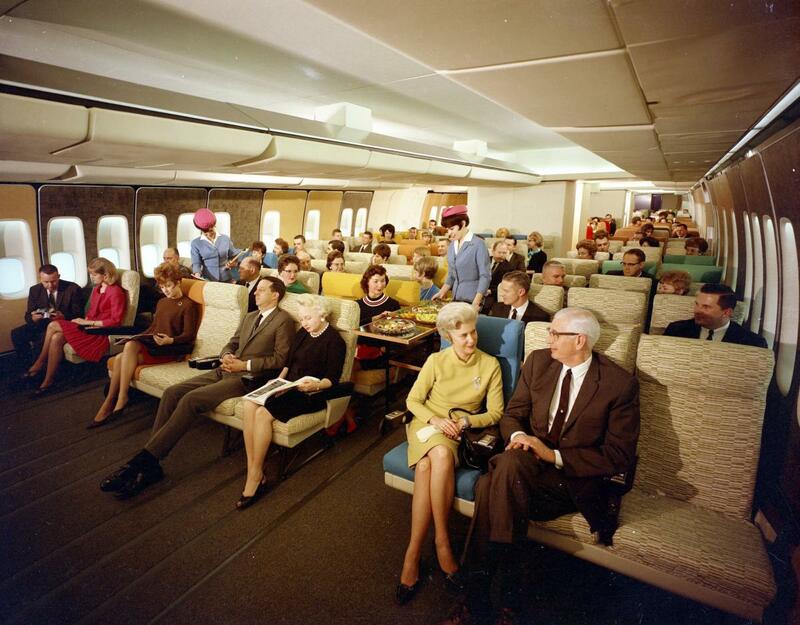 The birth of the Boeing 747 in the late 1960s heralded modern intercontinental mass transportation. It represents not only the impressive result of an intensive engineering and design process, but also the spirit of its era, a time when belief in progress, including access to air travel, was a phenomenal force. So much so that corporations and governments alike began to dream out loud about supersonic travel, about moving more people across the earth through sheer speed: more flights per day rather than more passengers per plane. Boeing wanted a piece of that prospective market too and launched a government-supported project to develop the 2707 SST, an aircraft planned to carry 300 passengers at three times the speed of sound. (By comparison the now obsolete Aérospatiale-BAC Concorde flew 100 passengers at twice the speed of sound.) The company considered the 747 a less-important intermediate product: something for the lower-end subsonic market. They expected to sell a couple of hundred units or so and projected that it would find more use as a container-carrying freight plane. It had to be developed within 28 months, which was 30% faster than usual even for a normal-sized jet, let alone an entirely new flying colossus. While the 747 was still in development, however, the government cancelled the SST programme, finding it neither cost-effective nor fuel-efficient. While it still existed the SST programme drained valuable resources, leaving Joseph Sutter, engineering chief of the 747 project, grappling with a lack of company support. 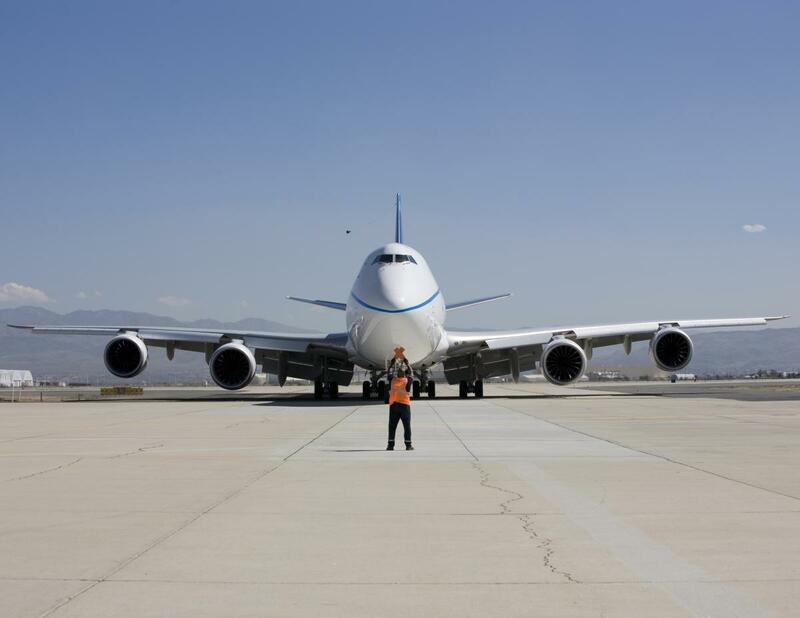 Nevertheless, he and his 4,500-member engineering department set out to develop a very large airplane suitable for both freight and passengers. This group in turn became the core of the 747 programme led by Malcolm Stamper, involving a staggering total of 50,000 people committed to developing the market, negotiating financing, training pilots, and safety testing each and every component. Furthermore, PanAm Airlines, as Boeing’s most important customer, also exerted an unprecedented influence on the design process. 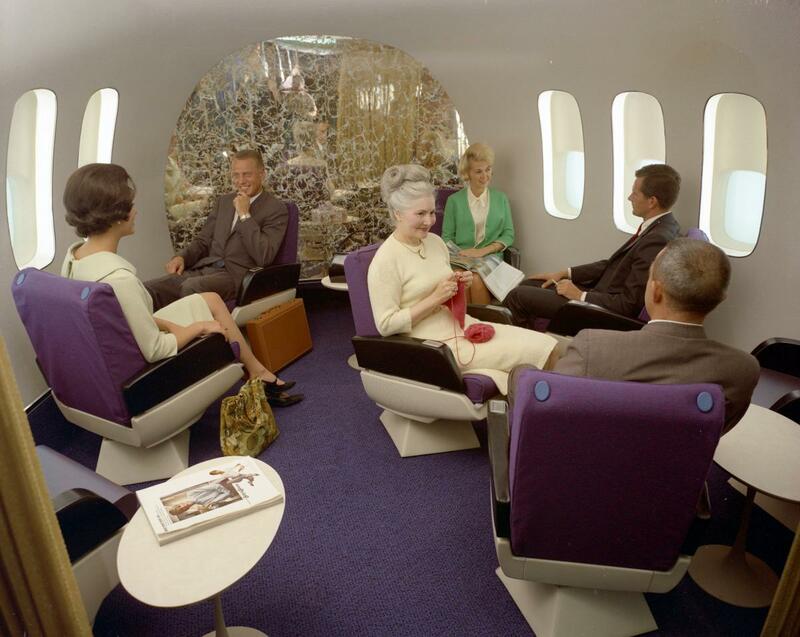 The Boeing 707 (predecessor to the 747) could carry up to 219 passengers. 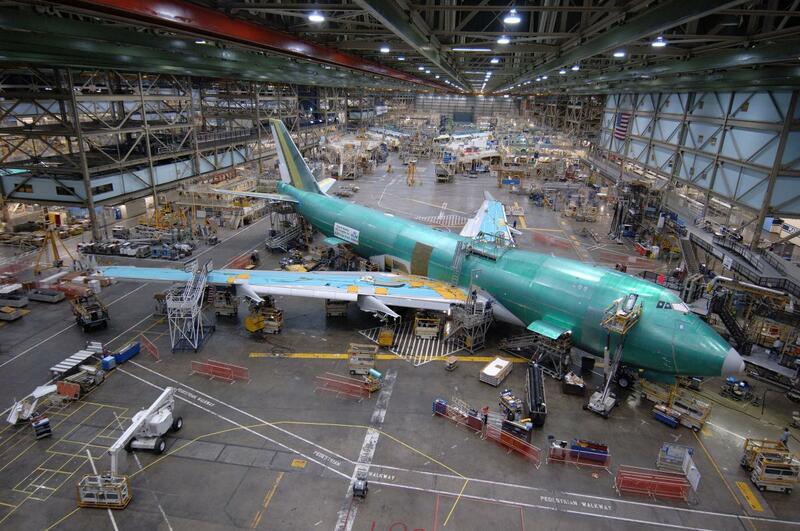 The first Boeing 747 could carry up to 550 passengers. 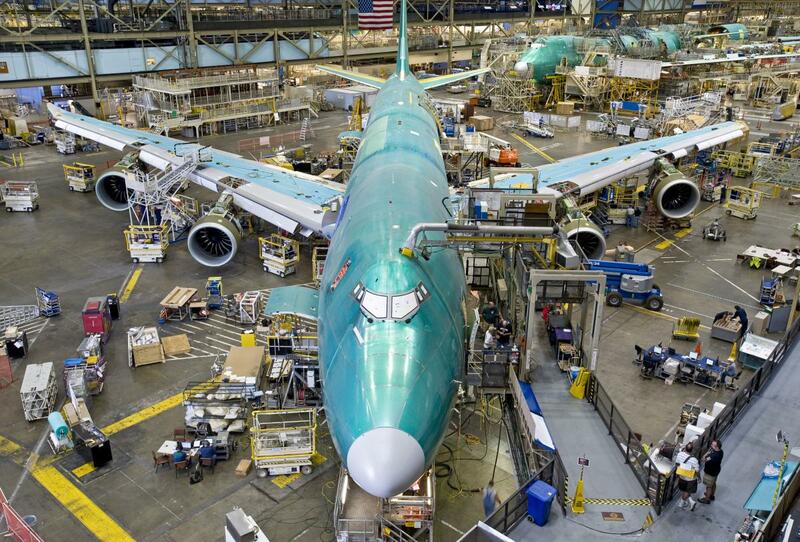 The newest 747 can carry up to 605 passengers. In his autobiography 747: Creating the World’s First Jumbo Jet and Other Adventures from a Life in Aviation Sutter relates how he had to negotiate some pitched battles during the design process. Many, if not most of them, concerned weight reduction, how to balance the systems and components essential to safe, comfortable flight with the profit-eating expense of transporting their combined weight. Every aspect of the plane’s design was the subject of intense discussion within an extensive community of people representing different interests, objectives and opinions. No doubt one of the most heated debates concerned the basic shape of the fuselage. The general belief, one shared by many of Sutter’s personnel as well as by PanAm CEO Juan Trippe, was that the design process would inevitably produce a double-decker craft: a tall, narrow airplane with two floors. This was mainly due to cues taken from ship design and the general idea that the passenger airplane was a flying ocean liner. Words like ‘crew’, ‘captain’ and ‘purser’ still bear witness to this association. Giant passenger ships are made larger by adding decks, and indeed this was the idea that Sutter started with, but as he continued to draft and design this model it began to present problems. In freight applications, for example, the height of the fuselage would make it difficult to load and unload containers. In passenger applications, the height of the upper cabin would make completing an emergency evacuation within the required 90 seconds dangerous, if not impossible. Searching for alternatives, Sutter and his payload engineer Milton Heinemann started to think along ‘heretical lines’ as they put it, developing the idea of a wider, double-aisle fuselage. They started to explore this novel concept and discovered that although it might be somewhat heavier, the spacious cabin would be much more comfortable for passengers. And loading freight into such a wide body would be much easier. The cockpit would sit above the front loading door in the nose, trailed by a fairing, a curved surface to reduce drag, creating a modest extra deck and the 747’s characteristic bulge. 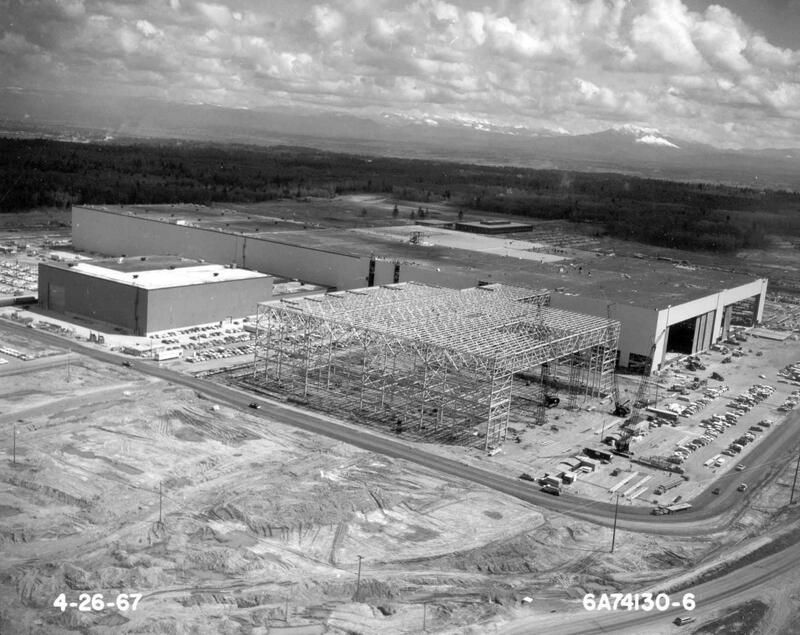 The design process included the construction of a gigantic new production facility, the Boeing Everett Factory, to this day by far the largest building in the world. The engineers realised that they would have to work hard to convince double-decker believers to accept this radical departure from the traditional approach, and that it was possible that after the first rumours of the wide-body solution started to circulate, Sutter could suddenly find himself replaced by someone willing to pursue the double-decker concept. Fortunately, by that time he had gained sufficient authority to weather that conflict. With Boeing finally more or less behind him, the next, even more crucial, step was to gain the support of Juan Trippe. A meeting in New York with PanAm representatives was arranged for this purpose, and Heinemann, more diplomatic and less explosive than Sutter, was chosen to present the new concept. Heinemann went about it cleverly, reserving a conference room 6m (19.7 ft) wide, exactly the width of the proposed cabin design, so that the executives present could experience it directly. He let the space speak for itself, and it was a convincing argument. Before a final decision could be made, however, there had to be one more meeting at the Everett facility where PanAm representatives could compare full-scale mock-ups of the double-decker and wide-body models. When Trippe enquired about the space inside the fairing atop the wide-body fuselage, Sutter replied that it could be used by the crew as a place to sleep or relax. When Trippe disagreed, saying that the space would be used for passengers, Sutter realised that his wide-body concept had won. But he probably still didn’t realise that his design would become an icon of the airline industry for decades to come. Ed van Hinte is a writer and design researcher at DRS22 in The Hague, Netherlands. He focuses on lightweight structures and loves complex design procedures. Airplanes are where his interests meet.